GREAT GIFT FOR THE RACER IN YOUR LIFE! We spent over a year revising and consolidating our famous Upper & Lower Engine Assembly volumes into one, great new book. Here is your chance to find out what really makes horsepower in a racing engine. Don’t be misled by the myths and misconceptions. This book contains the best information and latest technology from our staff of expert head porters, machinists, and assemblers. 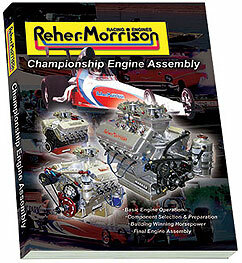 We are convinced that this is the best “how-to” racing engine book ever written! The book is huge, containing 392 pages of information and over 600 detailed photos and graphics that show you the right way. This is the book that several colleges recently selected to feature in their race engine technology programs yet, you’ll find it easy to read with simple terminology in carefully organized steps. Call Toll Free…855-467-4880 to place your order!